I’ll add that I never did anything with my annoyance at fanfiction; it’s not like I ever found a fanfiction writer and told them they should be doing something more productive with their time. It was just that I was irrationally annoyed by this kind of hobby because after all you can’t publish a story that’s about someone else’s characters or uses someone else’s premise! What were they thinking? But obviously–as detailed in the comic–I came to realize people write for many reasons. Just because I had no desire at that time to connect with other people’s ideas about fictional characters that didn’t belong to them, and wasn’t seeking a bonding experience between fans, and didn’t want to spend my writing time using someone else’s characters . . . does not mean there are no reasons to do those things. Furthermore, fanfiction can be a training ground if you do one day want to write your own original stories. So much has to be done when you write a novel–not only do you have to invent your characters and their back story and their premise and their plot and figure out pacing and learn to write dialogue and come up with engaging relationships . . . you also have to master the mechanics of writing. It’s very intimidating for some people, especially if they don’t know where to start. So they can start with something they love. Maybe they want to know what it would be like if two characters who aren’t interested in each other in the original had a romantic relationship with each other. Maybe they want to invent their own character and bounce them off of characters they love. Maybe they really like a plot concept and want to set their story in an existing world. They can take these smaller steps on their own terms, without much pressure since they know they can’t publish fanfiction traditionally, and then they can develop skills and increase confidence. Get the feel for how words flow for them. Understand how to approach peers for proofing. Learn discipline. Or . . . not. Because you don’t have to justify an interest in writing fanfiction by claiming it’s preparing you to write original material. 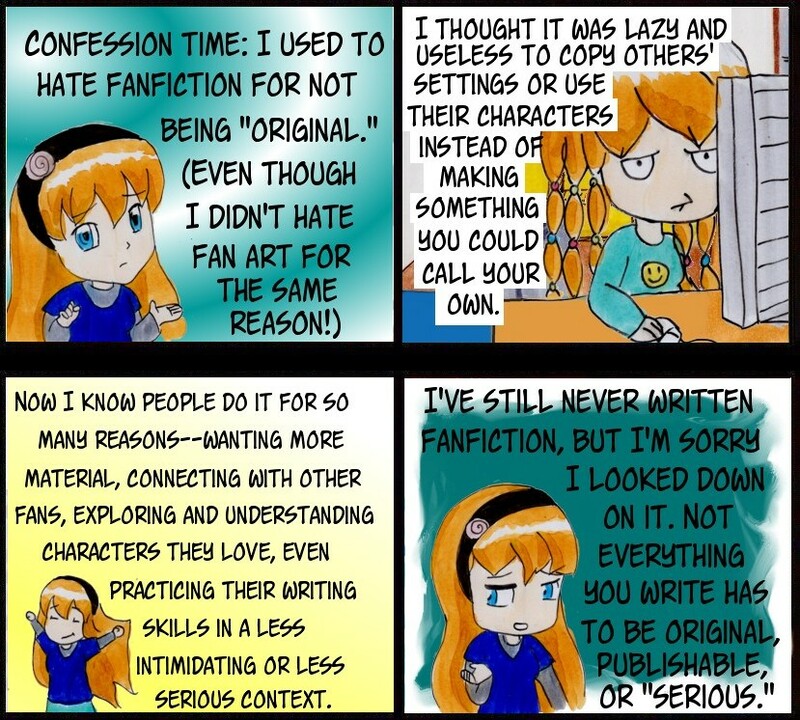 If fanfiction is it for you, and it’s a hobby, and you love it, there’s no shame in that. Enjoy it however you want. And don’t let snobs like my former self make you think you’re a lesser writer because of it. Authorized “fan fiction” for franchises like Star Wars or Star Trek or Dr Who gets published on a regular basic. Of course, the chosen writers have an established track record.